Heat olive oil in a pan and add onions and fry well. Add Chunked beetroots and fry for 5 minutes. Now,add pepper powder as the beetroots are sweet. Fry well and add vegetable stock and let it boil for few minutes. Its time to add milk and let it boil for 5 minutes. Cool the mixture, and blend to smooth paste. Garnish soup with green onions and serve with salt and pepper. 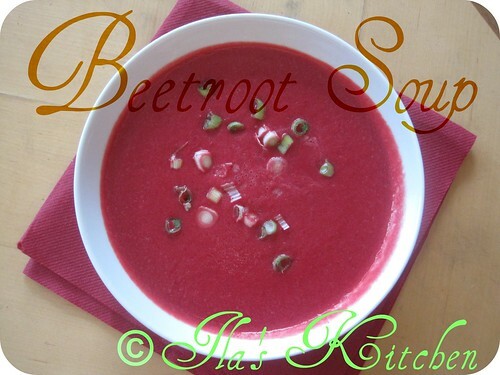 This healthy Beetroot Soup can be served for evening refreshment. 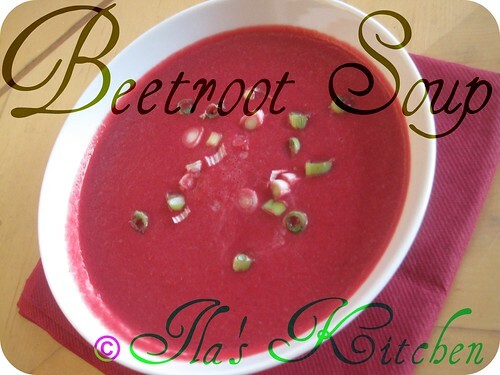 It is amazing how beets give that pink color to the food... Nice soup! healthy and tasty soup.love the colour. Lovely and colorful soup..looks fabulous. Beet root soup looks delicious. Cudn't agree more.. ...red is really attractive.....very yummy looking soup!!! Lovely colour..eye appealing...looks good..healthy soup. Very catchy and filling soup,simply delicious..
healthy and tasty soup.love the color. wow so colorful and healthy soup !! Love beets dear and this soup must have tastes EXCELLENTE~!